By LUDWIG VON KOOPA - There's an implicit message against streaming games somewhere in this. Apparently, there are a lot of young kids out there being lead into the transsexual life. This isn't a rant about that, but just some necessary background. It turns out that feuding with biology is possible but expensive, so advocates want to help by fund-raising. What's a great way to make money? Charity game streaming, apparently. Hey, if it works for cancer, it'll work for transsexual kids. And apparently it does actually work, especially with celebrities backing it, like 29-year old recently-inaugurated United States representative (representing the 14th district of New York) and socialist Alexandria Ocasio-Cortez (or AOC). We haven't mentioned her at all on KoopaTV, but our brother-from-another-mother site discusses her literally every other day. No one will appreciate if we satirise them by never talking about AOC, so we might as well do it once. And it's about videogames! What did Donkey Kong 64 do to deserve that characterisation? 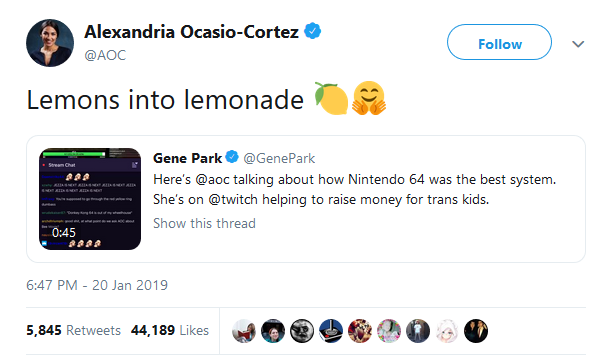 People are saying that Ms. Ocasio-Cortez is a “one of us” gamer, and it's obvious from her own explanation that she's not. She's definitely a socialist, though. Socialists don't like private property ownership—they want a public, community Nintendo 64, rather than people each enjoying their own. It's a scary philosophy, but it's one that Alexandria Ocasio-Cortez lives out personally, unlike some of those hypocrite liberals who espouse one ideal and then live the opposite. If you want your own game consoles that you can play for yourself without the government making you share it, vote differently in the 2024 presidential election. ...And while you're at it, whomever the Democrat nominee of 2020 probably feels the same way as Alexandria Ocasio-Cortez, but isn't as open about it. Consider that, too. KoopaTV might be the only videogame site that reported this story with an unapologetically anti-socialist slant to it. That's a bit concerning. There should be more. But there isn't. That's why KoopaTV is a valuable resource of the Internet, and it's a good idea for you to stick around for future KoopaTV articles! Don't ask Ludwig if lending games to friends is considered socialism, too. Or if sharing KoopaTV articles for free is considered socialism. Since it's not obvious from this article, Ludwig doesn't have any nostalgia for the Nintendo 64 and disagrees with the idea that it's the best. Was it the best system of all time? Calling ANY system that would be an exaggeration, really. But what it was was the end and beginning of an era in video gaming. And many of the games for the N64 continue to stand the test of time--even if some of them have done so via HD remakes. Also, I think at this point nearly as high a percent of Americans would vote for the piece of wood from Ed, Edd, & Eddy for president of the United States, so that poll really isn't so frightening to me. Something has to be the best! Pokémon Snap being the best gaming has to offer is a strange opinion though. ...When was Pokemon Snap brought up? She's saying the Nintendo 64 is the best console based on SM64 and Snap. Oh. Must've glossed over that paragraph, sorry.